We all experience, in varying degrees, stresses, worries and intrusive thoughts that can make us feel anxious. Sometimes that anxiety can get on top of us so much that we start to behave out of character, become immobilised with fear or agitated with panic. How we deal with these symptoms can vary from self-medicating with drugs and alcohol, to avoidance, overeating or withdrawing from life, which may work in the short term, but if we are seeking long term wellness, what we need is some clear strategies both to deal with acute symptoms as well as a daily routine that helps to maintain our overall wellbeing. If you have experienced anxiety, you’ll know there are things you can do that help with the variety of symptoms. Talk therapy, time in nature, time with family and friends who love you, healthy diet, exercise and sleep are all great for dealing with anxiety. 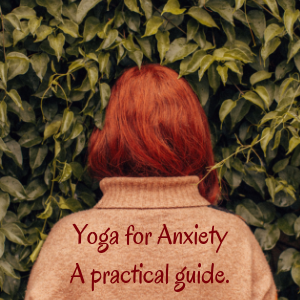 Yoga can also be very helpful for anxiety too. But not all yoga. Yoga that is tailored to your needs. Practicing hot, fast yoga in a crowded gym room with clear glass walls on all sides, sweaty people on treadmills staring in at you, and banging dubstep music might even give you an anxiety attack. What Kind Of Yoga Is Beneficial for Anxiety? The goal of a yoga practice for anxiety is to help calm the mind. This can involve many practices including postures, breathing exercises, making sound/ chanting, meditations and mantras and that create more stability, clarity and ease in the whole body-mind. Generally speaking we breathe slow and deep and focus on a single point - usually the body or the breath, which helps a racing mind become more still. We may synch up our movements to the breath (at a pace that feels good for you) and taking some postures in stillness (with support and gentle guided relaxation). Like a river that carves it’s way through rock, the more often we practice yoga for anxiety, the better we become at guiding the mind back from chaos to stillness. Practicing a little everyday, even just 10 minutes when you wake up, will help. Today I have pulled together a variety of practices to support you to reduce anxiety, improve sleep and overall wellbeing. Watch the first video below, where I give a bit of an intro and share my favourite (somewhat unusual yoga practice) for anxiety. Find a comfortable place to sit or lye down. Turn your phone off and make sure you will not be disturbed for at least 15 minutes. Perfect to practice as soon as you wake up or right before bed. Before bed we prepare the body to rest with mostly forward folding postures close to the ground, make sure you are well supported and can relax in stillness. In this video, I will guide you through the set up of the postures (using props from home, blankets, pillows, towels etc) and give guided relaxation instruction while you are in them. Once you have watched this video, you’ll be equipped with the knowledge to take yoga poses before bed to help you prepare for sound sleep. Put your yoga mat against a wall where you have space to put your legs. Place your buttocks as close as possible to the wall (you can have them on the ground or raised up on a blanket or pillow as I do in the video) It is easier to get up, if you curl to your side first, pressing your hip to the wall and then turn when you can stretch your legs straight against the wall. Close your eyes or use an eye pillow. Clear your mind by focusing on your breath or relaxing music. Take deep breaths in equal length: Example: 5 counts to inhale, 5 counts to exhale (longer or shorter as it suits you, as long as you maintain an equal breath) Allow yourself to release tension here as you hold this pose for as long as you like. Your heart rate typically slows down and your parasympathetic nervous system switches on to bring about a sense of calm and wellbeing. I created this divine playlist created for a two hour restorative practice leading in to meditation. Perfect for sleep too! The tracks are chosen for their deeply relaxing, yet delicately uplifting sounds. The last five tracks in particular are incredibly mellow and perfect for evening yoga or to go to sleep to.